This version of Fruited Spinach Salad is just boosted up a notch in both flavor and color! It's just bursting with juicy spring and summer fruits, crunchy fresh vegetables, before being drizzled with a light raspberry vinaigrette dressing. The minute the warm summer air and sunshine hits in March I start really craving this salad! I can't wait to grill some chicken so I can pull this together with some fresh raspberries and blueberries, crunchy fresh slices of bright yellow summer squash, as well as flavorful chunks of seasoned grilled chicken, and sprinkled with toasted pumpkin seeds. Then topping it off with a raspberry (or strawberry) vinaigrette dressing. Come on.. let's get digging into this amazing salad!!! Fruited Spinach Salad is just boosted up a notch in both flavor and color! It's just bursting with juicy spring and summer fruits, crunchy fresh vegetables, before being drizzled with a light raspberry vinaigrette dressing. 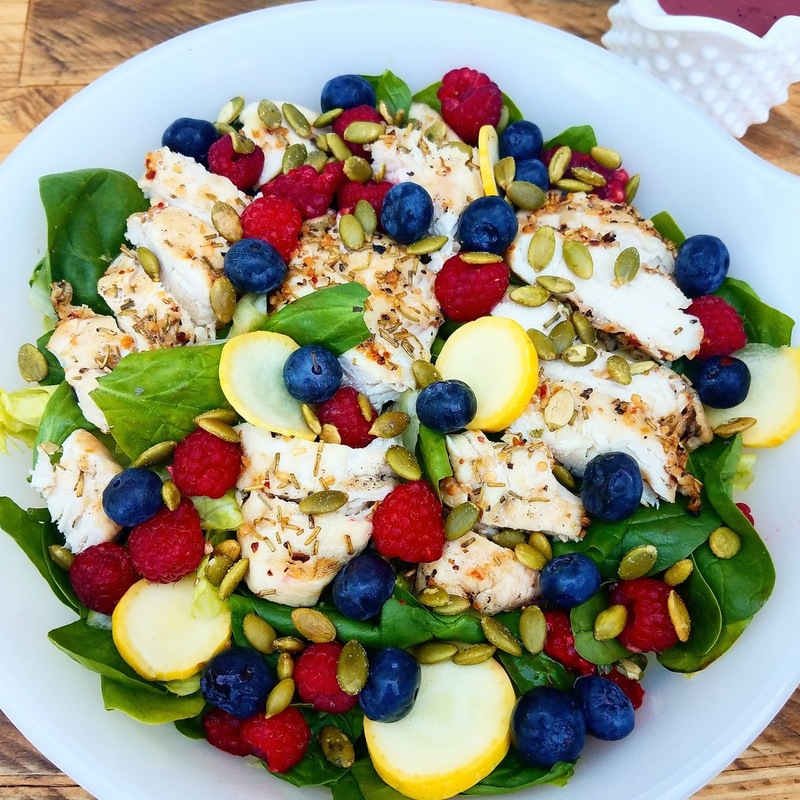 Rinse Greens, mix together and divide between 2 bowls or plates.Layer each salad with grilled chicken.Divide Raspberries, Blueberries, and Squash Slices equally between each salad, and distribute evenly on each salad.Top with Pumpkin seeds, and drizzle with Raspberry Vinaigrette dressing. I love adding protein to a lovely salad. I often put blueberries in salad but not raspberries. I need to try this! Thanks for sharing! What a colorful and delicious looking salad! Yummmmmm!